Sir William Cecil: You must confront the truth, madam. She has a claim to your throne. Queen Elizabeth I: You would have me depose a sister monarch. Sir William Cecil: It is either civil war there, or civil war here. The Oscar race continues… Here are two new movies that are possible contenders and since they are both talking about historical English queens, let’s take a look at them together. 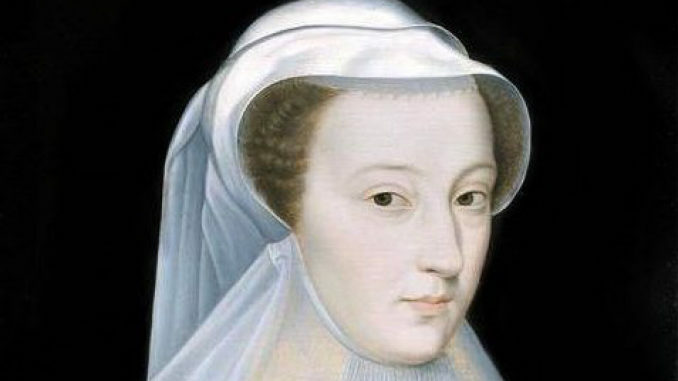 Mary Queen of Scots pits the two famous female rules – Elizabeth I who defied all the succession odds when she became the English queen in 1558 and remained on the throne for 45 years, and Mary Stuart whose actual rein was both short and tragic but whose son, James VI has achieved what neither of the queens managed to do – rule over both England and Scotland. The famous rivalry between Elizabeth and Mary has provided artistic material for countless books, poems, plays, biographies and at least six major movies. This latest film version has an interesting, modern, point of view. Any biography usually reveals not only the historical facts about its subject but also a political or social climate of the time it was written, and this #MeToo revision is no exception. It is based on an award-winning book by John Guy, an English historian whose research directly in the national archives of England and Scotland (as opposed to using 19th c. archival abstracts) has led him to a re-evaluation of Mary’s reputation. Queen Elizabeth’s counselor William Cecil has done a lot of editing to create a lasting image of Marty as a promiscuous schemer and that is how she has gone done in history for centuries. Fake news are nothing new. The movie picks up the modern point of view from Guy’s biography that most of the vilification of Mary has been done by Elizabeth’s camp to justify Mary’s imprisonment and her eventual beheading. Margot Robbie portrays Elizabeth and she is the second Australian to do so (Cate Blanchett created the queen twice – in Elizabeth in 1998 and Elizabeth: The Golden Age in 2007). An Irish-American star Saoirse Ronan plays Mary as a vivacious and temperamental young woman whose determination and smarts help her to survive for a while but are not enough of match against the political situation around her. We watch the two of them on a political collision course. Mary, having returned from a short betrothal to a French king Francis II who died in 1560, has to rule a small, poor country where she does not know neither the people nor the Gaelic language, and she does not have any strong political alliances amongst her courtiers. She also has to wage an internal war with her step-brother while avoiding a war with her cousin Elizabeth and a much more powerful country. Her biggest obstacle is the fact is that she is a woman- a lot of her subjects and powerful lords rebel against a female ruler. Her value lies mainly in an ability to produce an heir to the throne. Mary twists and turns like a worm on a pin. She avoids a pitfall of marrying Elizabeth’s envoy of Robert Dudley which would make her a pawn in her cousin’s hands. Instead she marries Lord Darnley and she produces the required male heir (watching how she gets the succession process completed is a cringe-worthy moment of cinema). Then she is forced into another marriage, “forced” being an operative word – you get the picture. Mary’s path was to be married three times in search of protection that her royal status was unable to provide, and to produce a future king of unified England and Scotland, even if the price of this strategy was literally her head. We watch the opposite side: Elizabeth, who spent her youth under a threat of a political execution (her father, Henry VIII used it on her mother after all), is now in power but she is destined to spend her entire reign being pushed and pulled by her advisors, detractors and courtiers. England of the 16th century is a powerful country rising to even greater power through early colonialism and the takeover of Catholic church lands. Elizabeth has all the might of a feudal monarch of that powerful kingdom but… she was born a woman. She knows that moment she marries and produces an heir, her power will wane and her usefulness will diminish. We all know her choice to remain a “Virgin Queen,” married to her country but not giving up on her real power until her death at a late age. The Favourite provides an equally revisionist if not outright feminist take on English history, this time tackling the reign of Queen Anne (ruled 1702-1714). It’s a very stylized comedy but it roughly follows the historical facts, albeit with a modern, irreverent approach to the monarchy and a woman’s perspective on the three protagonists of the story. Queen Anne (an exquisite Olivia Coleman in the movie), although she was a politically involved ruler and presided over a unification of England, Scotland and Ireland, in her private life she was plagued by ill health, conflicts over succession with her royal relatives, and seventeen miscarriages and deaths of her children, none of whom made it to adulthood. The second protagonist of the story is Sarah, the Duchess Marlborough (Rachel Weisz)- a long-time favorite who by all accounts (including the Queen’s correspondence) dominated Anne and influenced her political decisions. The third player in this literal comedy of manners is Abigail Hill (Emma Stone), a historical figure of the Queen’s maid who rose to prominence as a favorite, replaced Sarah as the queen’s confidante, and she eventually married a nobleman. The director Yorgos Lanthimos is famous for creating strange, confined worlds in his movies (check out popular arthouse titles Dogtooth or Lobster) and he does not disappoint in this one. The court of Queen Anne is a societal trap. Both the Whigs and the Tories are forced to argue military strategy with a ruler who has no idea what waging a war means. Fashion dictates that both men and woman of aristocracy wear elaborate wigs, powdered and rouged faces and high heels – incredibly constraining and ugly. Both favorites – Sarah and Abigail- are totally dependent on Queen’s whims, sexual demands, and weird mood swings. You either conform, or you die a social or even a real death – tertium non datur. The Favourite is not aiming to be a biography or even an accurate portrait of the early 18th century (costumes and interior design are heavily stylized)- it is a comedy about royal “mean girls” who fight for favors, except this is an English court and not a high school and the “queen bee” happens to be a real queen. 18th century hasn’t been so much fun on screen since Amadeus and Barry Lyndon.